We often see posts on forums from concerned fishkeepers who are worried about something they’ve seen relating to fish welfare. Sometimes this relates to shops, sometimes to conditions of tanks in public places like hotels and doctors’ surgeries. There can be quite a variety of reasons for someone being concerned and seeking advice on how to do something about it. Posting on forums can be a good way of gauging if the complaint is valid, or the problem a known or commonplace one. But do be aware of hearsay and don’t let your judgement be clouded by other peoples’ assumptions. If you’ve witnessed a genuine problem posting about it on an internet forum won’t necessarily solve it, it is far more effective to deal directly with those that can help resolve it. INJAF isn’t here to raise your concerns for you; we want to help you raise them yourself so we’ve put together this article to help you decide if your concern is warranted, and to help you decide what to do if you want to take it further. The advice we offer is based on our own understanding of the relevant policies and legislation; we cannot, and do not, offer legal advice or consumer advice. If you think we have made an error with any of our interpretation of policies/legislation please contact us on info@injaf.org. Fish are now covered by the Animal Welfare Act 2006. This imposes a duty of care on whoever is responsible for looking after an animal, including fish. This means that everyone from a shop owner to whoever looks after a school fish tank to the fishkeeper at home has to abide by the Act. We’ve started our article with this as it an over-arching piece of legislation and affects everything in our article. These are governed by additional legislation which can help you decide if your concern is warranted. All shops selling pets have to be licensed to do so. The Pet Animals Act 1951 is the legislation that sets out what a shop needs to do in order to be eligible for a license. Licenses are granted by the local council once they are satisfied that the shop meets the criteria set out in the legislation. On top of this there are also Model Conditions for Pet Vending Licencing 2013 applicable to licenses issued to pet shops, some of which make specific reference to fish. These were compiled by the Local Government Association in response to concerns that pet shop license conditions were not always consistent. The ‘model conditions’ are intended to be used by local authorities when setting out the criteria for pet shop licenses within their area. Please see the Pet Animals Act 1951 Model Standards for Pet Shop License Conditions for further details (it’s worth a read, there are some interesting points raised). Each local authority should have their own license conditions listed on their website, or available from their offices. All pet shops are required by law to have their license on public display. The license gives details of the local council who issued the license, as well as the name of the person who inspects the shop (it’s often the same person every year). Some shops are also members of OATA (Ornamental Aquatic Trade Association) and as such are obliged to abide by the OATA Code of Conduct, and uphold their Customer Charter. You can use OATA’s search function to find an OATA retailer near you. If a shop is a member of OATA and you are concerned about something you can contact OATA for further information/advice. OATA have all sorts of information available which may be of use, see our further reading section for more information, or see their website. Some of the common concerns we often see voiced on various forums may simply be due to a lack of understanding on the part of the complainant, or a case of human error on the part of the shop. When assessing whether or not you want to take your concerns further do try to consider all angles and make sure you’ve not inadvertently assumed the worst. We’ve put together some information on some of the issues that we see raised most frequently. Overstocked/over crowded tanks – many shops have large, central filter systems which are designed to cope with filtering the waste from a huge number of fish at once, far more than in a domestic set up. Shop tanks are not long term homes for fish, they are holding tanks and the fish are often only in there for a few days before being purchased. Over crowding can sometimes reduce aggression which can be helpful for shops in the short time the fish are with them. It’s not reasonable to judge a shop tank’s stocking level against that which you should be aiming for in your own set up. Incompatible fish housed together – ideally we would like to see shops display fish together which can actually live long term together as what is seen in a shop is often taken as inherent ‘advice’ by inexperienced keepers. Again, bear in mind that fish are only in shop tanks for a very short period of time. Sometimes incompatible fish in the same tank can be a simple explanation such as human error, perhaps a new member of staff has misunderstood something and it’s not yet been picked up by a more experienced staff member. Or perhaps there has been an emergency and some fish have had to be put together while some equipment is mended. Dirty tanks – shops should make an effort to ensure that their tanks look clean as this is what appeals to customers as much as benefiting the health of the fish. However, a ‘dirty’ tank doesn’t always mean that the water is poor quality. A bit of algae on the glass doesn’t necessarily mean that the water is polluted. Check the condition of the fish; if they appear healthy and lively then it’s likely that the water is in good condition. Dead fish in the tanks – unfortunately some fish won’t survive the experience of being transported from the breeder, or wild caught location, to the shop and onwards to your tank. Many fish are very young when offered for sale and not all young fish will make it to adulthood even under the best of conditions. Any dead fish should be removed as soon as possible after they are noticed, or pointed out. If a staff member does not remove a dead fish there and then it might be that they are in the middle of dealing with something else and will come back to the problem once they’ve finished. Other fish will naturally pick at dead bodies (fish can be quite unpleasant sometimes!) so a slightly mangled corpse doesn’t automatically mean it’s been there for hours, it’s possible the others have been having a go at it. If there are a lot of dead fish in any one tank that could well indicate a more serious problem, but the odd one or two is unfortunately an unavoidable part of trading in live fish. Diseased fish in the tanks – diseased fish should not be offered for sale. Some problems can break out very quickly and what might at first glance seem like a problem that’s been in progress for a while may be a recent event. If a tank has diseased fish it should ideally be labelled so that customers are aware that there is a problem being dealt with. This reassures the customers and prevents the staff having to constantly reassure people throughout the day. Quality of information/advice – it is often assumed that shops are only out to make a sale. Of course shops want to make a sale, but they should also be interested in the welfare of the animals they are selling. Your own research should help prevent any mistakes as you should be fully informed on the fish you want to purchase, and the equipment you need, before you buy. Staff should be happy to discuss things with you, but bear in mind the pressures they are often under, especially at weekends when customer turnover is high and it may not be possible for them to spend the time they would like to with each customer. Reputation – sometimes a shop, or brand, can get a reputation (especially online) for being prone to certain problems. Sometimes this can be made worse by other people repeating things they’ve read, or heard of, without actually experiencing it for themselves. It is unwise to automatically assume that shops will have certain problems. Use others’ experiences to help inform your decisions but check out shops for yourself, see what you think and judge them from an informed point of view. Unsuitable products – there are a variety of products offered for sale which are often unsuitable for the purpose they are promoted for. Perhaps the best example of this is the traditional goldfish bowl, these are great for a nice fish-free display of aquatic plants but completely useless for goldfish, the fish explain why in our article here. If you see a product for sale that you feel is inappropriate you may wish to raise the question of its suitability with the retailer and/or manufacturer. Unsuitable fish – sometimes fish offered for sale are unsuitable for the home aquarium (see our articles on Tankbusters and The Big Fish Campaign for more information). If you see a species for sale that you that you feel is unsuitable for the home aquarium you may wish to broach the subject with the retailer. 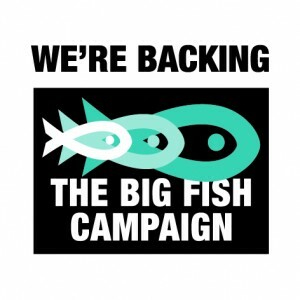 If you see one of the six feature fish from the Big Fish Campaign for sale you can contact the Big Fish Campaign. INJAF strongly encourages fishkeepers not to purchase ‘tankbusters’ unless they are fully informed of, and totally committed to, their through life care. Dyed fish/tattooed fish – it’s not currently illegal for dyed/tattooed fish to be imported into/sold in the UK. INJAF strongly encourages fishkeepers not to purchase these fish if they are seen for sale as the methods of dying and/or tattooing them causes serious welfare problems. Practical Fishkeeping (PFK) has a long running anti dyed fish campaign and retailers are able to sign up to a voluntary pledge not to sell them. If you see them for sale, especially where the retailer has signed up to the PFK campaign, you may wish to raise your concerns with the retailer and/or PFK. Fish requiring licenses to own/sell – some fish are illegal to own or sell in the UK if you do not have an appropriate license. If you see a controlled species being offered for sale where the retailer does not have the relevant license/s you should report it to DEFRA as well as raising your concerns with the shop and local authority. It is very important that you do report any instances of fish being sold illegally as there are very good reasons for these fish being controlled. Please see the links in the ‘further reading’ section for more information. GM fish – ‘Glofish™’ are a relatively recent arrival on the aquatics scene and have brought a mixed reaction. These fish are created by splicing a gene from a jellyfish into those of danios. The jellyfish gene enables fluorescence in the fish which would not otherwise have this feature. It is illegal to import and/or sell these fish in the UK. If you see these fish offered for sale you should contact the GM Inspectorate. Please see the link in the ‘further reading’ section for more information. This is not bad customer service! If a shop won’t sell you any fish there is a very good reason for this. A good retailer will care about the fish they sell and will not want to sell them to someone who isn’t ready for them or who won’t be able to house them appropriately. If your tank isn’t ready, or isn’t the right size, or has fish which will be incompatible with the new ones, or any other reason which causes them to doubt your readiness for the new fish then a decent shop is unlikely to be willing to sell them to you. Goods must: Fit the description given. Whatever you buy should fit the description given to the product. Packaging, labelling and any description given must be clear and honest. And: Be of satisfactory quality. You have the right for the goods you buy to be safe, work properly, and to be free from defects. And: Be fit for purpose. Any goods that are sold to you must be capable of doing what they’re meant for. If you feel you have been mis-sold something, for example you asked specific questions when purchasing and stated a specific requirement for the item in question but later discovered that the item wasn’t suitable, you may have some comeback under the above legislation. How best to raise your concerns? It rather depends on what the problem is. A dead fish is a relatively simple one; a quiet word with a staff member should be enough. The same is true of diseased fish; a quiet word with someone should be enough to highlight your concern and alert them to a possibly unnoticed problem. Talking to staff is a good way to broach the subject of a concern. If you try to get to know the staff in your local shop, and chat to them when you don’t have concerns, it may help you be listened to if you do feel the need to raise a concern about something. You may want to ask to speak to the manager if you feel your concern warrants it, or the member of staff you’ve spoken to is unable to help. Whoever you speak to it is best to remain calm and polite as this is most likely to lead to a positive outcome. Try not to assume that the shop staff don’t know what they’re talking about, be open minded and give the shop a chance to explain the situation. If you are unsatisfied with the results you may wish to take your concern further and put it in writing, either by letter or email. If you decide to address your concerns in writing to the manager, owner or head office you should make a note of the problem that concerned you, the date and time, what action you took in the shop and who you spoke to (if applicable). If you feel the nature of your concern is serious or that a shop is contravening the conditions of their license you can report them to your local council. The contact details should be available on their website. If you report a concern by telephone you may be asked to follow it up in writing, so be sure you’ve made a note of all the details. If you feel the shop appears to pose a hazard to the public or the animals being sold, it would be helpful to write to your local council addressing the letter for the attention of the inspector named on the license. It can be distressing to witness problems in pet shops where you feel animal welfare is at risk. This can sometimes make it difficult to approach the problem effectively as anger and emotion can cloud things. If you feel you are too upset or angry to deal with the problem in a positive and effective way at the time it is often better to take a note of things and address your concerns in writing when you’ve had some time to review the situation. eBay – selling live fish via eBay is allowed under certain circumstances, see eBay’s policies on prohibited items and animals and wildlife products for more information. If you feel a seller is breaching these policies with any listings you should contact eBay’s customer support. Go to the listing, and then click the Report Item link on the right hand side of the page. Other online retailers – check the ‘contact us’ details for any online retailers you are concerned about. You may be able to raise your concerns through their site, or by email. The Citizens’ Advice Bureau website is the official site for all consumer related information and advice, you may find it helpful to check the site or contact them for more information if you feel goods are being sold inappropriately. Many schools, doctors, dentists, hotels etc. have fish tanks on display. We’re working on producing some resources aimed at helping those who look after these tanks to gain a better understanding if they are not experienced fishkeepers themselves, so watch this space for more. In the meantime there are plenty of things you can do to help if you are worried that a tank isn’t being maintained properly. Speak to the management and check who is responsible for maintaining the tank. It may be that there is a member of staff who has responsibility, or perhaps the work is shared out among various people. Find out more about the maintenance routine and feeding regime, this will help you offer suggestions for improvement if necessary. Perhaps you may be willing to spend some time helping out yourself, or know someone who would be willing to give up a little time to help staff get on the right track. If you are concerned about incompatible species of fish living together, or if the tank is not appropriate for some of the residents, it would be helpful to explain the implications for the fish and help the staff understand their needs in more detail. If you are able to help with suggestions for re-homing any of the residents it might enable the staff to sort out a more appropriate selection of fish for their tank. You don’t need to re-home them personally of course, but pointing staff in the direction of people who may be able to help such as trusted fish shops, local aquatics societies and forum members would be a positive action. The websites listed on our recommended forums page have some excellent caresheets and fish profiles as well as some helpful articles for beginners to more experienced keepers. You may wish to print off some information to help out those who are looking after the tank. You could suggest that whoever is responsible for looking after the tank joins one of our recommended forums if they feel they need some extra support and advice. The internet can be a great source of information, and unfortunately also of misinformation. Internet forums can be a mixed bag, some are generally very good, some are not, and different forums tend to attract different levels of experience. If you feel a need to raise a concern about information or advice offered on an internet forum there are a few things that we would suggest you bear in mind if you choose to do so. Generally speaking, information provided on forums is well intended and those offering the advice are usually doing their best to help. Sometimes someone offering advice may have misunderstood something, or been given incorrect advice in the past themselves. People rarely offer advice that they know is completely incorrect. The body of the letter – detail your concern, the date, time, what happened etc. An email version should be in a similar format, you may wish to provide your name and address but this is not necessary as your email can be replied to directly whereas a written letter needs a postal address for a reply to be sent to. You can omit the date and address of the company you are writing to. It’s a good idea to request a delivery confirmation and read receipt on the email if your mail server will allow it. If something is concerning you, doing something is always better than doing nothing, a little effort can often make a lot of difference. Facepalm moments: Things not to say in an aquatic store! Good service/bad service – what do you want?